Physicists in the College of Arts and Sciences have made several important discoveries regarding the basic structure of mesons—subatomic particles long thought to be composed of one quark and one antiquark and bound together by a strong interaction. Recently, Professor Tomasz Skwarnicki and a team of researchers proved the existence of a meson named Z(4430), with two quarks and two antiquarks, using data from the Large Hadron Collidor beauty (LHCb) Collaboration at CERN in Geneva, Switzerland. This tetraquark state was first discovered in Japan in 2007 but was later disputed by a team of researchers at Stanford University. Skwarnicki’s finding was published earlier this month and has since garnered international publicity. Quarks are hard, point-like objects that are found inside protons and neutrons and form the nucleus of an atom. Now, another analysis by Syracuse University physicists—this one led by Distinguished Professor Sheldon Stone and his research associate Liming Zhang—shows two lighter, well-known mesons, originally thought to be composed of tetraquarks, that are structured like normal mesons. Stone points out that his and Skwarnicki’s analyses are not contradictory and, together, increase what physicists know about the strong interaction that forms the basis of what holds all matter together. Stone’s finding also changes what is known about charge-parity (CP) violation, the balance of matter and antimatter in the universe. That there is a small amount of excess matter (e.g., protons, neutrons and orbiting electrons) floating around in the ether implies that something other than the Standard Model of particle physics is at play. Stone also hopes his findings may shed light on why heavy quarks are able to form four-quark particles and light ones cannot. “How do you explain some of the interesting characteristics of f0(980), if it’s not made of four quarks?” asks Stone, whose analysis also draws on LHCb data and has been submitted for publication. Meanwhile, the tetraquark nature of Z(4430) also has huge implications for the study of neutron stars, remnants of gravitational collapses of massive stars. 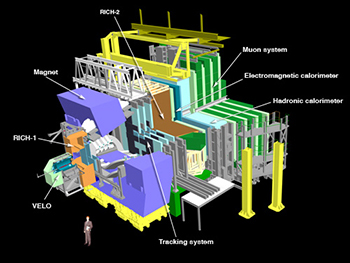 LHCb is an international experiment, based at CERN, involving more than 800 scientists and engineers from all over the world. At CERN, Stone heads up a team of 15 physicists from Syracuse University.